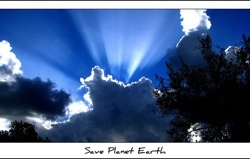 "Save Planet Earth" - Is it even wise to think on such a grand scale? Some suggest geo-engineering as a “fix” to climate change. Technology wrought large. Techniques such as using mirrors or seeding the atmosphere with sulfur particles to block solar radiation from reaching Earth’s surface could cool the planet, but with its own unintended and undesirable consequences. In an essay in last Friday’s Science Daily, scientists warn that the risks of global-scale geo-engineering far outweigh the possible benefits. Ecologists speaking at the annual meeting of the Ecological Society of America held a symposium to discus some of the methods proposed for large-scale manipulation of earth’s natural systems to absorb atmospheric CO2,, affect cooling, and thus reduce warming. Despite this interest in geo-engineering as a solution to global warming, most scientists at the meeting consider not worth the risk any attempt to engineer climate at a global scale. The bigger the scale of the approach, the riskier it is for the environment,” says Robert Jackson , director of Duke University’s Center on Global Change and the meeting’s organizer. One method called “atmospheric seeding,” uses light-colored sulfur particles and other aerosols to reflect sunlight back into space, much like what happens when a volcano erupts. When Mount Pinatubo erupted in the Philippines in 1991, the Earth cooled by as much as 0.9 degrees Fahrenheit. But can we really manufacture the natural phenomenon of a volcanic eruption? Given what is already happening with our current global (if unwitting)-scale experiment on the atmosphere, do we really want to go down the road of further “engineering” the climate in hopes of controlling it to our benefit? Probably not says Simone Tilmes, a researcher for the National Center for Atmospheric Research in Boulder, Colorado. Despite the overall cooling that such seeding might have, it could also have significant unintended changes in localized temperature and precipitation. Tilmes’ simulations also indicate sulfur seeding could lead to the destruction of the ozone layer protecting the surface from solar ultraviolet radiation. Okay, if we don’t want to mess around much (more) with the atmosphere, how about the oceans? The vast oceans are a huge carbon sink after all, why not enhance that natural ability to soak more of it up? Fertilizing the ocean with iron particles is one way to accomplish this, but it is a method that has been discredited for some time, and continues to be so. Oregon State’s Charles Miller sees many unacceptable risks in adversely effecting already diminished ocean ecosystems, all for a fix that doesn’t really work (Miller says at most the technique could only soak up a fraction of humanity’s current emissions) and likely exacerbates the problem of ocean acidification. Despite his warnings of global-scale engineering projects, however, Jackson urges continued research in geo-engineering – but at a smaller scale. Most notably among such options is geologic sequestration, a crucial element of any viable carbon capture and sequestration (CCS) scheme, touted by some as the poorly-named “clean coal” option. Even that is fraught with dangerous risks that we may be forced to take. Ultimately, the solution to anthropogenic climate change will not be a technological one. Technology is vital as a tactic, but perhaps useless as a strategy. Geo-engineering on a planetary scale, many scientists conclude, only takes us further down the path of the fool’s errand. Clearly, business as usual is dangerous. Economic resources required to replace fossil fuels, will have to gome at the expense of other societal needs. Let’s carefully explore all of the potential mitigation measures so that we can develop an optimum strategy. One that is cost-effective and environmentally acceptable. Ruling out one option without experimentally testing it would seem to be irrational.